In this section you will familiarize the Excel window that you are using, we labeled every part and try to explain what’s the use one by one. The two versions of Excel are almost identical, only the Office button is replaced with the File Tab, take a look of the parts of Excel 2007, you can click the image to enlarge. And this is also for Excel 2010. Ok, we will explain, the use and every part of the Excel window, just follow along. Quick Access Toolbar – Collection of buttons that provide one click access to commonly used commands such as Save, Undo or Redo. You can also customize this according to your preference, we have instruction how to customize here. Ribbon – The main set of commands and controls organized task in Tabs and groups, you can also customize the ribbon according to your preference, we got it covered in this instruction. Column Headings – The letters that appear along the top of the worksheet to identify the different columns in the worksheet. 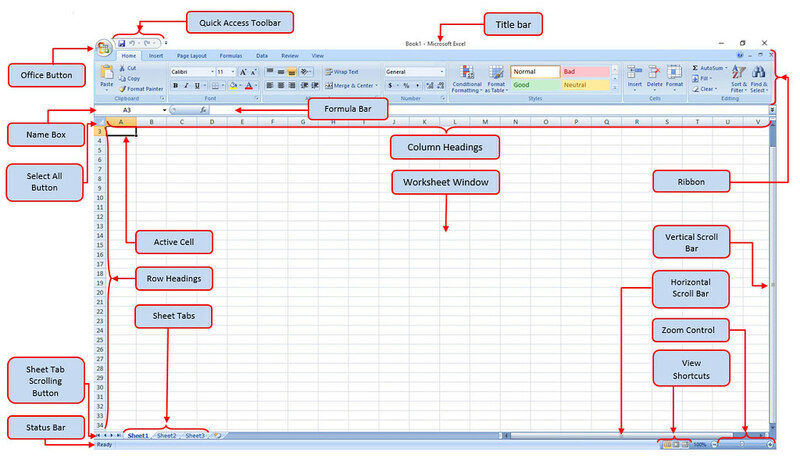 Worksheet Window – A window that displays an Excel worksheet, basically this is where you work all the tasks. Vertical Scroll Bar – Scroll bar to use when you want to scroll vertically through the worksheet window. Horizontal Scroll Bar – Scroll bar to use when you want to scroll horizontally through the worksheet window. Zoom Controls – Used for magnifying and shrinking of the active worksheet. View Shortcuts – Buttons used to change how the worksheet content is displayed. Normal, Page Layout or Page Break Preview. Sheet Tabs – Tabs the display the name of the worksheet in the workbook, by default its name sheet 1, sheet 2, etc. You can rename this to any name the best represent to your sheet. Row Headings – The number that appears on the left of the worksheet window to identify the different rows. 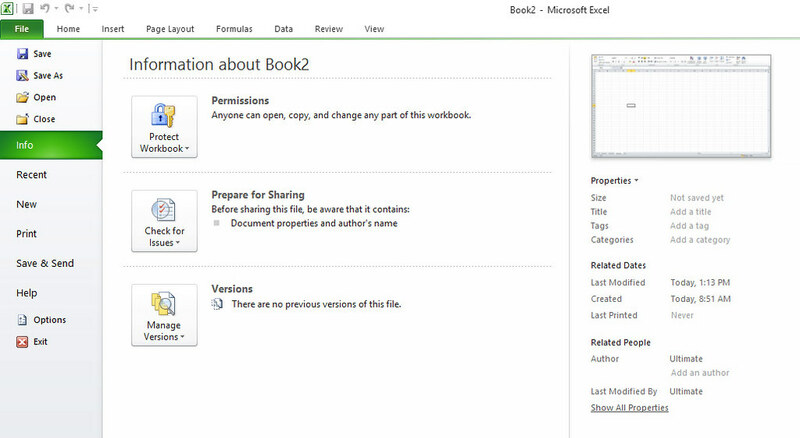 Office Button/File Tab – It provides access to workbook level features and program settings. 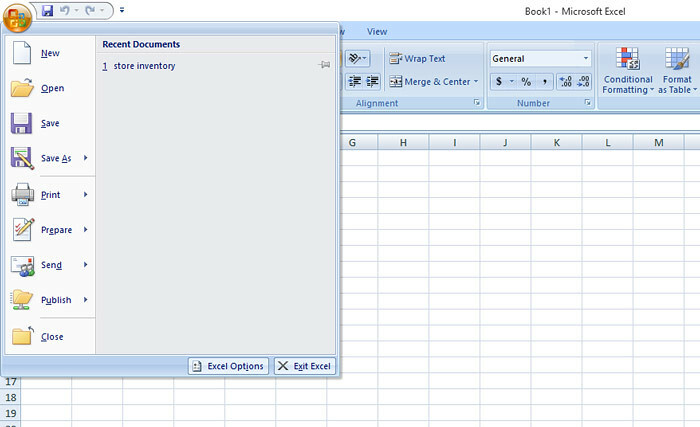 You will notice that in Excel 2007 there is a circle Office button while on the Excel 2010 it replace with File Tab. If you click the circle office button you will see this. And on the Excel 2010 File Tab it will reveal this window. Although when you see this, you will notice the big difference in the interface, but if you look closer, there are similarities, the Save, Open, New, Print, etc. And other basic control is both present in this window. 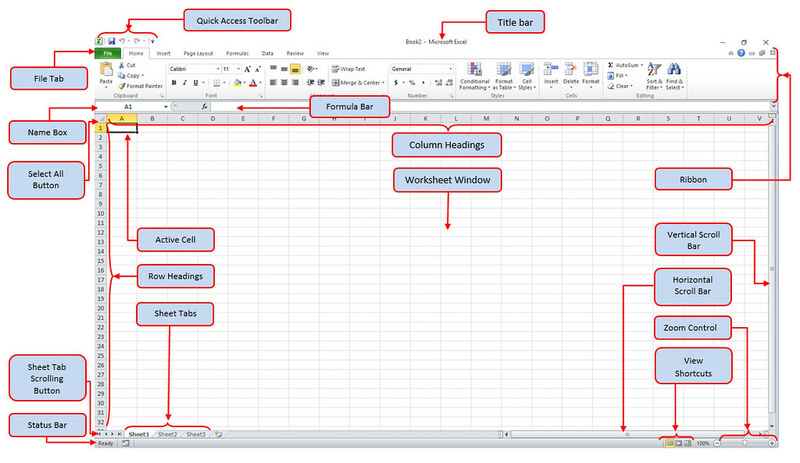 Now that you already know the parts of the Excel, we will now proceed to the basics in Excel. This will be discussed in the next chapter. Please can send me the vedio complete excel tutorials? I want a clear information about MS Excel.Can you please give me that?